UW's Engineering Summer Program is a competitive program and students interested in any career path are encouraged to apply. 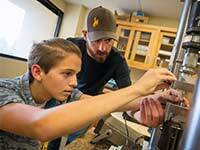 High-school juniors interested in making the next great discovery or improving the quality of life for the world’s population are encouraged to participate in the Engineering Summer Program (ESP), hosted by University of Wyoming’s College of Engineering and Applied Science. Applications now are being accepted for the 2018 ESP session, which takes place June 17-23 at UW. This weeklong program, available only for current high school juniors who will be seniors in the 2018-19 school year, aims to develop critical thinking and problem-solving skills. It is open to all students, regardless of state of residence. This is a competitive program and students interested in any career path are encouraged to apply. Those selected will have the chance to engage in exciting and innovative activities, such as building a digital circuit, programming a robotic device or designing timber trusses. To apply, please visit the ESP website. Students should review the application checklist to ensure full consideration for participation. The application deadline is March 24. For more information or questions, contact Teddi Freedman at esp@uwyo.edu or call 307-766-4236.